There is nothing more romantic than an intimate ceremony for just the two of you. Choose one of our Wisconsin elopement packages and we’ll take care of all the details so you have a stress-free, magical experience. 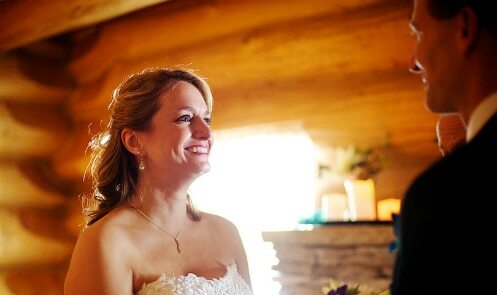 Elopement packages are customized to meet your special interests. Several sample packages are listed. A two-night minimum stay at our Wisconsin bed and breakfast is required and is not included in package prices. $399, lodging not included. Two night minimum stay required. $599, lodging not included. Two night minimum stay required. $699, lodging not included. Two night minimum stay required. Wisconsin residents must get the marriage license in the county where you reside. Then you can be married anywhere in the state. (If the Bride and Groom are from separate counties, you may go to either county.) Non-residents must get their license in the county that the marriage takes place. (Justin Trails Resort is in Monroe County.) Contact Monroe County Clerk’s Office 608-269-8705, 202 South K St., Sparta, WI. 54656. No appointment necessary. Both parties need to be present. Bring with you: Social Security number, photo id, certified birth certificate with stamp from register of deeds where you were born (not the hospital copy), if a prior marriage then you need a document stamped from court of divorce or annulment or death certificate. Contact Certified Wedding Venue Owner Donna Justin at 608-855-0282 or donna@justintrails.com for more information or to book your Wisconsin Elopement today!